Today I’m sharing all the details of my good friend’s modern black and white bathroom with brass accents! Last week we took a little trip back to our last hometown of Marquette, Michigan. It was the most refreshing and wonderful getaway that we’ve had in a LONG time. Both of us really unplugged and just enjoyed time with friends. We were spoiled to get to stay in our good friend’s beautiful new master suite! Thankfully she let me take some pictures to share with you all! This master suite is on the recently renovated third floor of my friend Heather’s home. I actually shared her home tour here, as well as her kid’s room here. To get to this point they had to tear of the roof, re-frame is all, and then build up from there. Once it was framed Heather and her husband Trevor did just about all of the work! 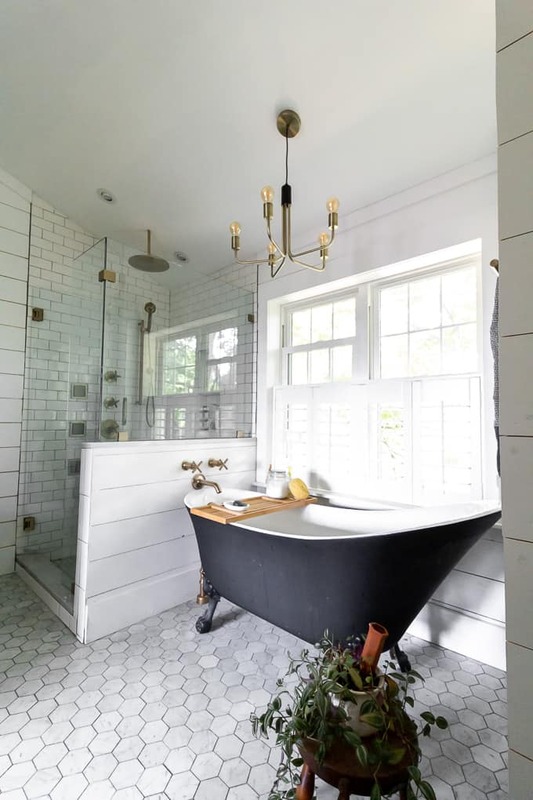 They were able to create a beautiful high-end bathroom with luxuries like in-floor heating, multiple shower heads, and this amazing clawfoot tub. Trevor is super handy, and Heather spent almost two years tracking down the best deals for every aspect. 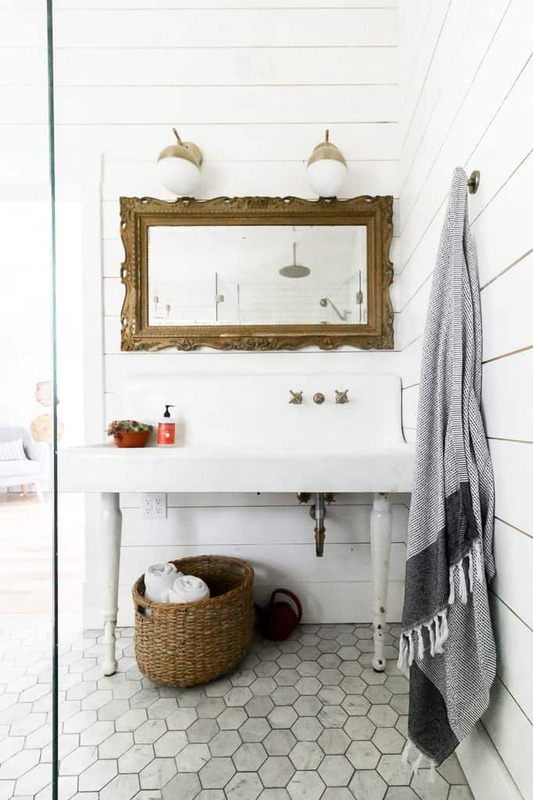 The vintage farmhouse sink was an Ebay find, and almost all of the Brass Kohler Fixtures were found at a discount on Ebay! 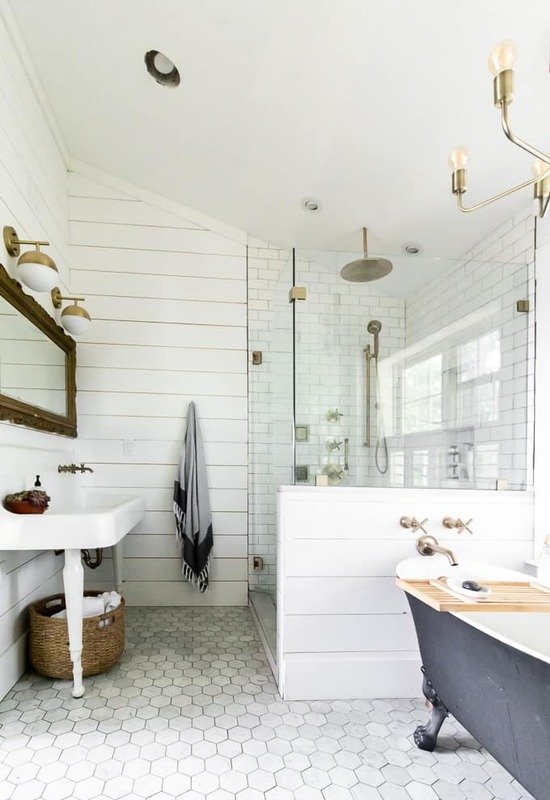 I love how they mixed the vintage sink and mirror, with modern aspects like the lighting and brass fixtures. Even the marble floor is a timeless material, but the hex pattern gives it a modern twist. Heather created additional storage for towels with this oversized basket under the sink. 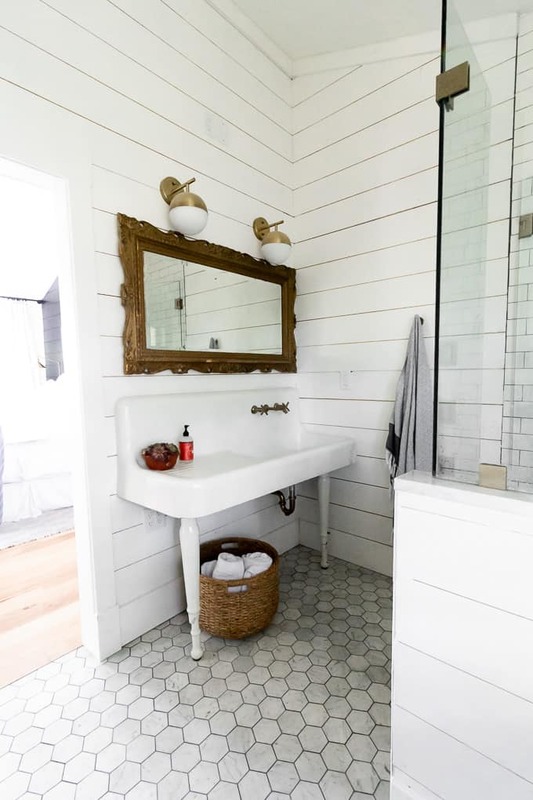 She also added the same Fouta towels that I used in our hallway bathroom. Heather had the manufacturer paint the outside of the acrylic tub black, which was so smart! I think it gives it such a modern look. 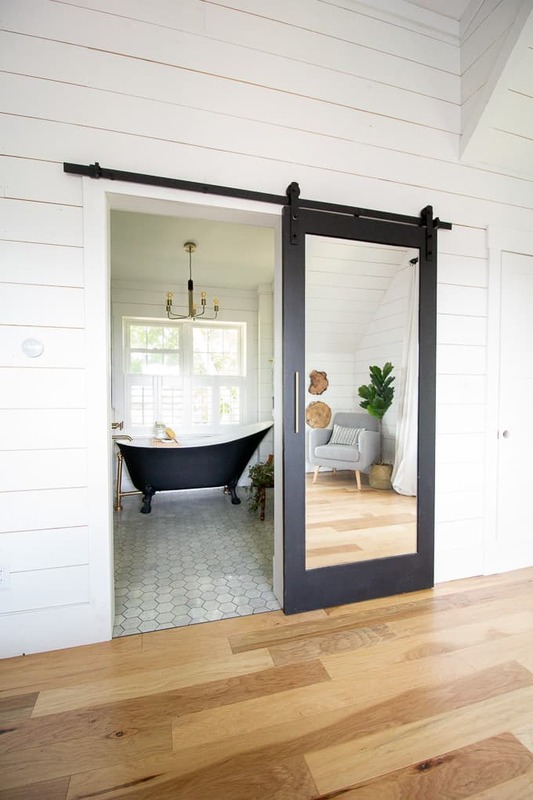 The shower glass was the only project that they hired out, and it gives the shower such an elegant feel. 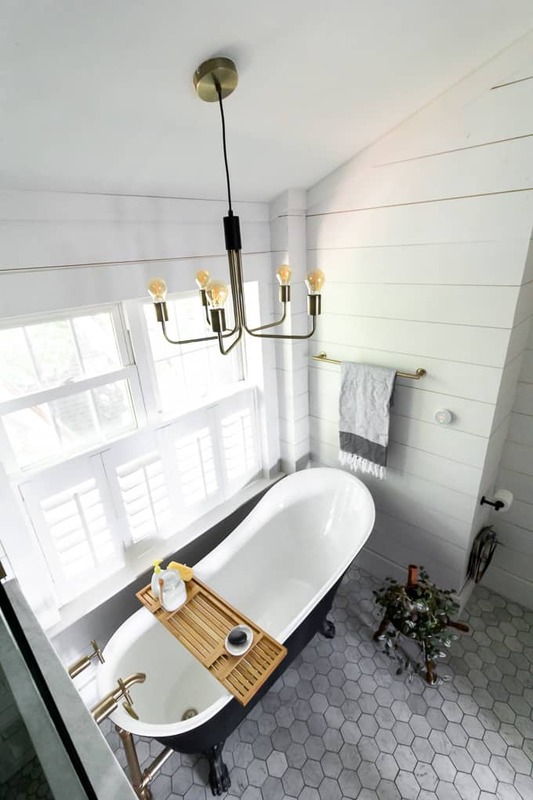 In order to give the window some privacy, they installed these white plantation shutters that work perfectly above the tub. This is a perfect solution without having to add curtains in a space where they would probably just get wet. Would you believe that she found that awesome chandelier on Amazon?! 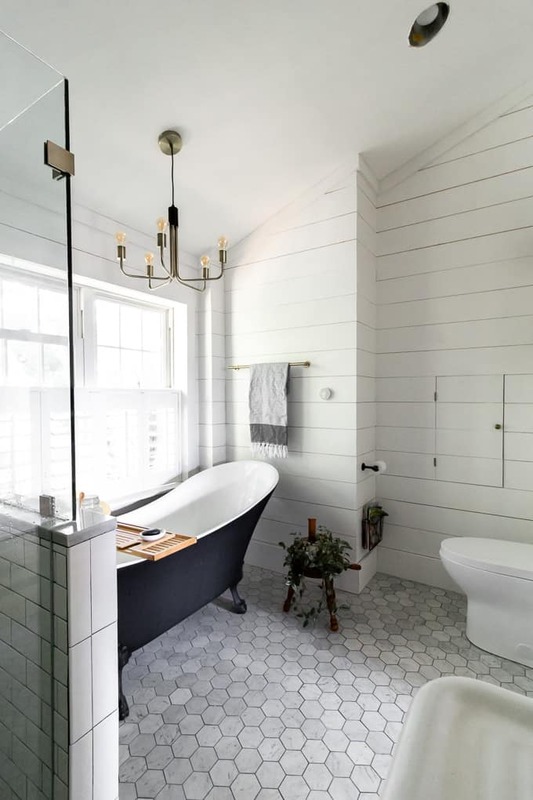 Everything about this tub area is stunning. 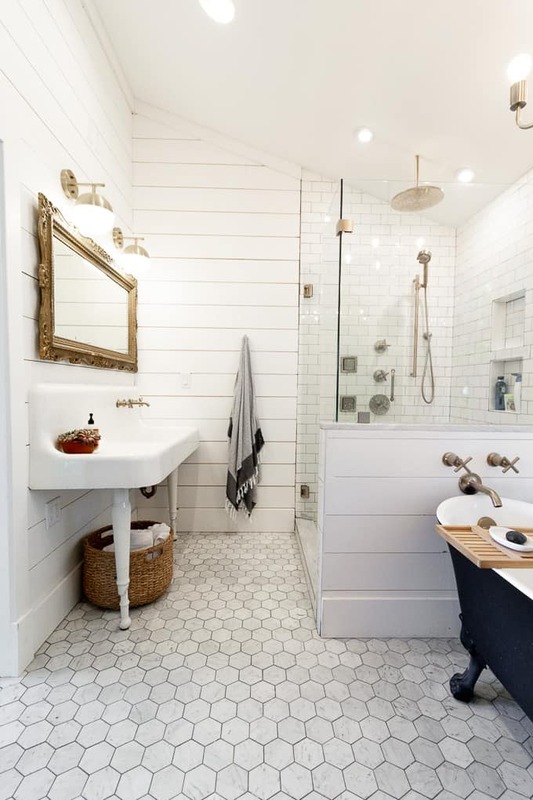 The bamboo tub tray adds the perfect bit of wood and texture. I also love how she staged that plant on the stool. 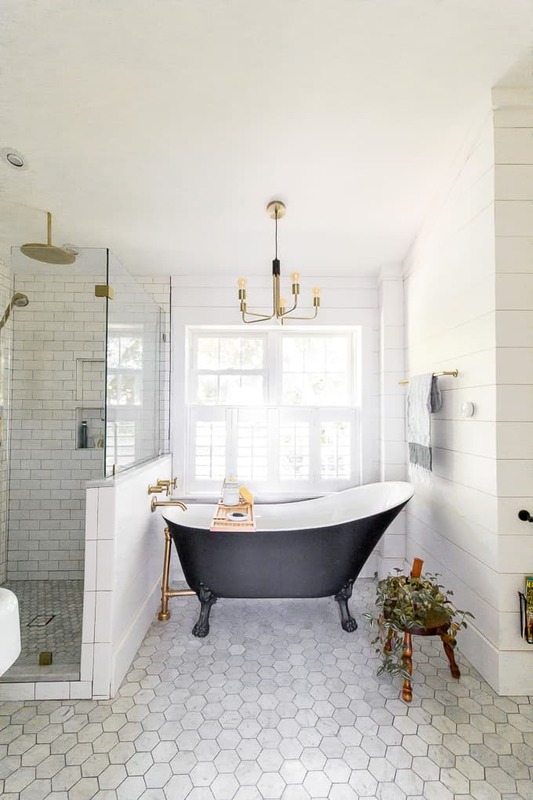 Thank you so much for stopping by today to see this beautiful modern black and white bathroom with brass accents! I’m so thankful that Heather let me share this amazing bathroom with you all! I’ve added shoppable images below for items that are either identical or as similar as I could find! Have a wonderful week! « Smart Home Devices Making our Home Happier! I bought the Fouta Towel. best towel ever! Awesome! So glad you love them! I do too! This is just beautiful! What a beautiful space to share with you and her guests.